Merry Xmas to one and all. At the last minute (of course!) we decided to head off to New Zealand for four days over Xmas. We flew in to Auckland on the way as we were unable to get a direct flight to Christchurch at such late notice. 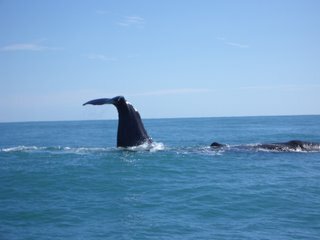 One of the main reasons for coming was to fulfill a personal goal and swim with dolphins, also to see some Whales. For many years I have had a fascination with these animals, even going as far as ‘adopting a dolphin’ via the Whale and Dolphin Conservation Society in the UK. There is an area approximately 180km north of Christchurch called Kaikoura and it is famed for Whale Watching Trips and also Dolphin Encounters. We arrived on Saturday 23rd and took the fairly lengthy drive to Kaikoura. We arrived pretty late and to be honest, we were absolutely exhausted. The night before we flew out, I was in a poker tournament and managed to finish in third place so that meant we did not get home until approaching 2am. On top of that, we had to be at the airport the following day by 9:30am. Add in to the equation the flights etc, you can imagine how tired I was. The last hour of driving was unbearable and on many occasions, I was ready to stop and sleep at the side of the road. Anyway, we made it up to Kaikoura, grabbed a sandwich as we had not eaten (apart from the food on the plane over, Air New Zealand First Class is excellent!) and went to bed. We had one huge concern… due to bad weather, the Whale Watching trips had been cancelled for the previous three and a half days. If we missed our arranged sailing at 6:15am, that would be it. We would not be able to get any others so, fingers were crossed. As the alarm went off at 5:45am, I dived out of bed to look outside the window to get an idea of whether we would be going, or bitterly disappointed. It looked nice out there so without delay, I called the company to ask if they were running. It was great news, they could not confirm any other outings for the day, but the first one, the 6:15 would sail, albeit with a ‘severe sea sickness’ warning. We got down to the ocean and eagerly awaited our trip. The place is very well run and loads of merchandise on offer for those that choose to purchase them. We boarded a bus and they took us to the port where we would be sailing from. All of the crew seemed very well informed and took us out on a catamaran. The sickness warning seemed to hold true and I must be honest, I did not feel in the best of shape for most of the trip but, it was worth the discomfort. Whilst out at sea we saw six huge Sperm Whales! (the tail of one is shown abovem just as it was about to dive down). In all, I guess we were at sea for about two hours. Unfortunately we did not see any Dolphins although to be fair that was not the purpose, the whales were. I hope we will have time to do the trip again before we leave but, we will see. We did actually also see several albatross. That was Christmas Eve. Christmas Day was also spectacular and if I am honest, one of the best I have ever had. We are staying at a place called Hapuku Lodge, just outside Kaikoura. The accommodation is incredible (although at $550 a night it should be!) Our room is an incredible Tree House! Very modern inside, loads of handmade furniture but with all mod cons. As most people who know me can vouch, I do like a little moan and am rarely satisfied by hotels. Not the case here. I would struggle to find a single fault with the place. Anyway, the made us up an awesome picnic (pictured much further above) including just about anything you would wish for and beautifully presented. We grabbed a bottle of champagne and fresh orange juice, got in the car and headed out to a local Seal colony about 10km away. On the way, we stopped at a local roadside “crayfish” café and purchased some freshly caught, freshly cooked garlic mussels. They wrapped them in much the same way we would wrap fish & chips in the UK, in paper. We then went to the seal colony, found a great spot and had an amazing lunch. Loads of seals around, playing in the sea and sitting on the rocks by us. I really could not have asked for anymore. An truly awesome day. After that, we returned to the tree house, had a siesta and followed this by a traditional Xmas Dinner. Far too much to eat but, don’t we always during the festive season! Tomorrow is our last day in New Zealand and, weather permitting, we are booked to go on the Dolphin Encounter, sailing at 8am. Fingers are crossed again. If the Whale Watching was anything to go by, it is going to be an exciting day.